We came up on the wrong side of the win/loss column, but the victories seemed to be everywhere last Saturday afternoon. For starters, our men's 400 medley relay took an easy victory and seemingly cruised to a 3:39... highlighted by freshman Won Ho's 51.5 fly split! 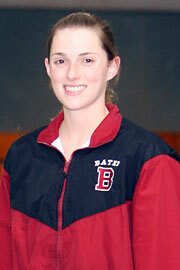 After that Kara Leasure lit up the pool with 3 wins in the 1000 Free (10:55), 200 Breast (2:28), and 200 IM (2:17). 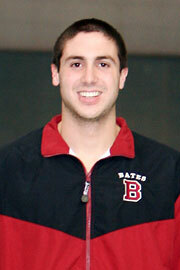 The 200 Breast is currently tops in the NESCAC. Charlotte Green remains undefeated in the 100 free popping a 54.6 and "feeling off." Following up Charlotte with great swims was Tom Boniface going in-season bests with a 1:49 and 49.3 in the 200 and 100 free, and Dan Aupi's three wins. As usual Travis Jones is improving every day - and with Coach Bartley at the helm, Saturday was just another example of great things ahead for that duo. Catherine Sparks lit up the 100 breast with a win lunging to a 1:09.7. An impressive swim for her at this time of year (I think faster than last year's conference meet). And Won Ho grabbed the last victory for us on the men's side posting a 52.5 100 fly time - and he made it look easy. I suspect he'll be real fast once he gets in shape!